I AM SO PSYCHED to announce that Honu the Sea Turtle is swimming to see you all in LONG ISLAND, NEW YORK on AUGUST 26-27!!!! 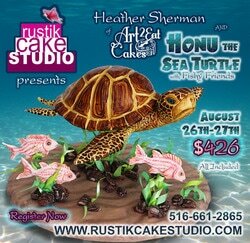 This epic class is hosted by the lovely Rocio Fukuda at Rustik Cake Studio , and will be hands-on two-day immersive creation of structure, sculpting, carving and much much more. We will work on REAL cake, and each student will leave with an edible showpiece.